Henriette Hertz came from a modest Jewish family. She was obsessed with art and literature and for a large part of her life she lived with the rich industrialist Ludwig Mond and his wife Frida, a friend from her youth. The Monds were also enthousiastic about art and contibuted to the financing of her art collection. She was a close friend of the philosopher Paul Deussen. When she died in 1913 she left her collection as well as the Palazzo Zuccari to the Kaiser Wilhelm Gesellschaft, on the condition that the Bibliotheca Hertziana would be founded and housed there. The Bibliotheca Hertziana was the first institute for art history in Rome. Nowadays it's part of the Max Planck Gesellschaft. 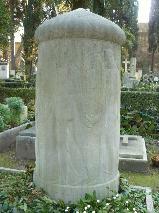 The grave of Henriette Hertz at the Cimitero Acattolico, Rome.